On Sunday, June 26, the Nation’s Capital Archives & History Program Center in Frederick, Maryland, opened its doors to the public. The Center’s grand opening was September 19, 2015, and programs are held there for troops on the 3rd Saturday and Sunday each month. Otherwise, the all-volunteer-operated center is open by appointment only. We are re-evaluating hours and program opportunities for the 2016-2017 Girl Scout year and hope to have more drop-in days. We are also planning a few training classes for adult volunteers. One guest–and now a new committee member–had several questions about former camps. She also shared memories of wading at camps in the 1960s. That reminded me of one of the most treasured items in our collection, the Murray Camp Scroll. Naturally, I had to pull it out. The scroll is the 1960 Camp Committee report, but rendered in a truly unique fashion. The scroll is about 80 feet long and was donated by the family of Ann Murray, a former Camp Committee chair. Isn’t it amazing? Archives and History Committee members LOVE to share our collection. If you haven’t been able to schedule a visit yet, contact me (ann@robertsonwriting.com), we’ll try to work something out. Stand covers are now available in white, too! Girl Scout historians know how challenging it can be to display vintage uniforms. Commercial mannequins can be expensive and usually are several sizes too large for the dainty uniforms of old. Dressmaker forms can work for adult uniforms, but are difficult to find in child sizes. I found a fantastic, very affordable solution at…..IKEA. Yes, the assemble-it-yourself Swedish furniture store! Who knew? IKEA mannequins in use at our Archives and History Program Center. The NÄPEN mannequins are sold in IKEA’s children’s department for the budding fashionista. They are sold in two parts: the stand and a cover. You could use the stand without a cover, but the covers give the torso more definition. The stands are light enough to take with you for programs, but heavy enough not to tip over. Total price is $19.99. Napen stand (402.379.15) , $14.99. The stand is metal and plastic and the height adjusts from 30″ to 50″. The cloth and wire cover comes in either lilac or turquoise. There is no size difference. If you don’t have an IKEA near you, consider ordering from the website. You can get an entire troop for $100. My research trip to GSUSA last week was cut short by Blizzard Jonas, but I was delighted to discover some interesting changes afoot. For the first time in nearly 20 years, the National Historic Preservation Center (NHPC) is undergoing a major transformation. The museum has been emptied and a completely new exhibition is being staged. The new exhibit is still a work in progress, but I will share a sneak peek. Vintage uniform display along corridor to executive offices. My only disappointment was finding out that the 11th floor cafeteria had closed. I was really looking forward to the best grilled cheese in Manhattan. I understand that regular staff probably grew bored with the cafeteria, but it was a wonderful attraction for visiting troops and researchers. It was affordable food, conveniently located near clean restrooms and the Girl Scout Shop – three selling points for any troop leader. As a researcher, it was nice to have someplace in the building, where I could grab a quick lunch and not lose valuable research time. At least from a visitor’s perspective, the cafeteria was a valuable resource that I’m sad to see eliminated. 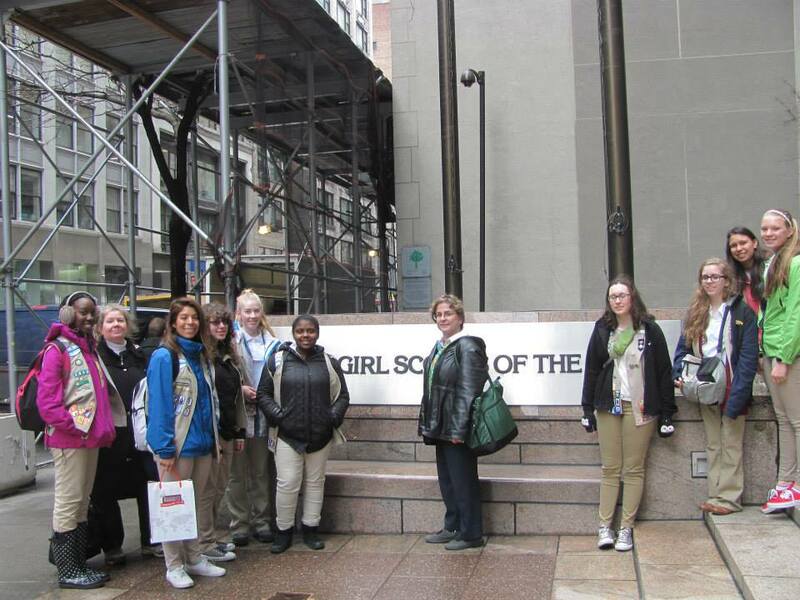 Last Friday my Girl Scout troop took a day trip to New York City. One stop was GSUSA and the National Historic Preservation Center. None of the nine girls and two co-advisors had ever been to headquarters, so I was looking forward to showing them around. I’m also very happy that co-advisor Sylvie Warren brought her camera and took these wonderful photos! After a very early morning bus ride from Bethesda, Maryland, we explored Times Square and Rockefeller Plaza, then headed south on Fifth Avenue to 37th Street, the main entrance to GSUSA at 420 Fifth Avenue. I had reservations for a 2 pm tour, and lunch at 1 pm in the GSUSA cafeteria on the 11th floor. There I ran into two NHPC staff members, consultant Martha Foley and Senior Archivist Yevgeniya Gribov, who would be giving our tour. After lunch, we headed up to the 17th floor for the National Historic Preservation Center. Yevgeniya greeted us in the lobby (where the girls quickly spotted the large jars of GS cookies). She told us the history of NHPC and led us into the document storage room. Although we could only look, not rummage through the boxes at will, it was still a treat. I made sure the girls realized that as many times as I’d done research at NHPC, I’d never been into the secure room before! Next, we went into the museum portion of NHPC, where I introduced the girls to Chief Strategist Pamela Cruz and Archivist Diane Russo. Then we had time to explore the historical displays. My troop has been to the Nation’s Capital archives on several occasions, but there were plenty of items they had never seen before. But their favorite part was watching The Golden Eaglet, a silent promotional film made in 1918. The girls decided they should start saluting their leader, like the girls in the film. I have no problem with that. Most of my troop is in the 11th or 12th grade and will be heading off to college soon. If nothing else, I know they understand that there is far more to Girl Scouting than just our troop. They’ve worked with other troops, been to day and resident camp, Rocked the Mall, visited Rockwood, and one even worked with pandas in China on a Destination trip. 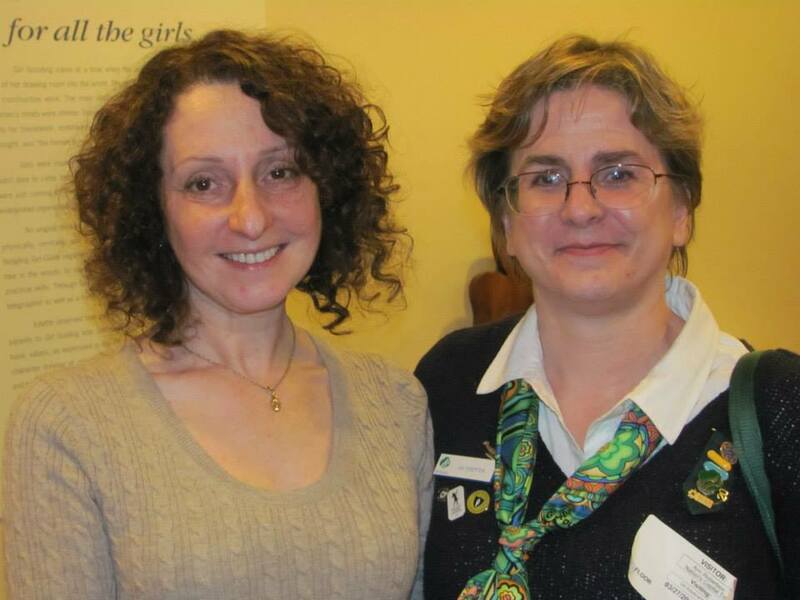 They also know about the women and girls who came before them, and how the Girl Scouting has responded to social change. They are the newest generation in a long line of courageous, strong women, and our movement is lucky to have them. We all know about cookie patches and profits, but what other prizes come with cookie sales? 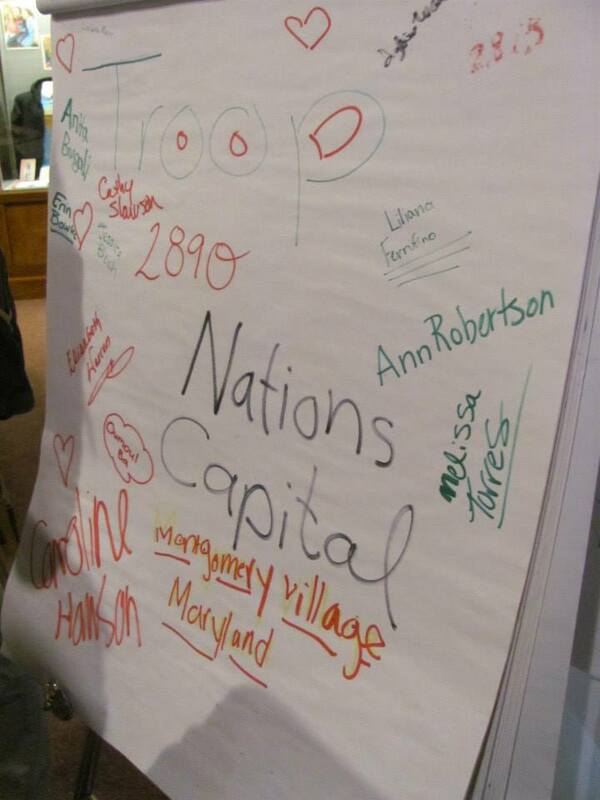 To earn their Museum Discovery Interest Project (an old teen badge), my troop of Seniors and Ambassadors created the new exhibit at the Nation’s Council’s main office. They decided to focus on four types of cookie awards: to girls, to adult volunteers, to councils, and to the entire Girl Scout movement. The girls visited the council storage facility to select items from the council collection, searched their own rooms, borrowed from older and younger sisters, contacted one of the council’s top 100 sellers, and sorted through items loaned by members of the council Archives and History Committee. 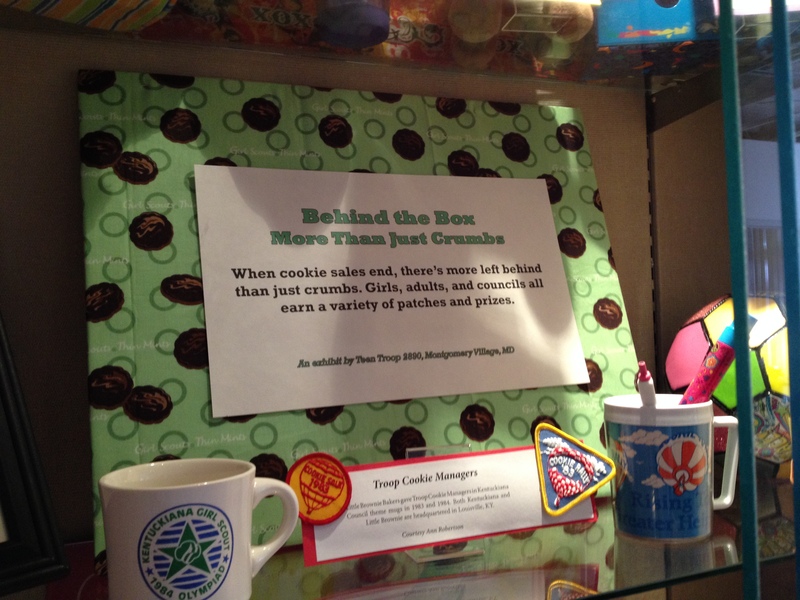 I loaned a few items, such as mugs from when I was a troop cookie manager in the dark ages, and the girls made thorough use of my cookie patch collection, too. 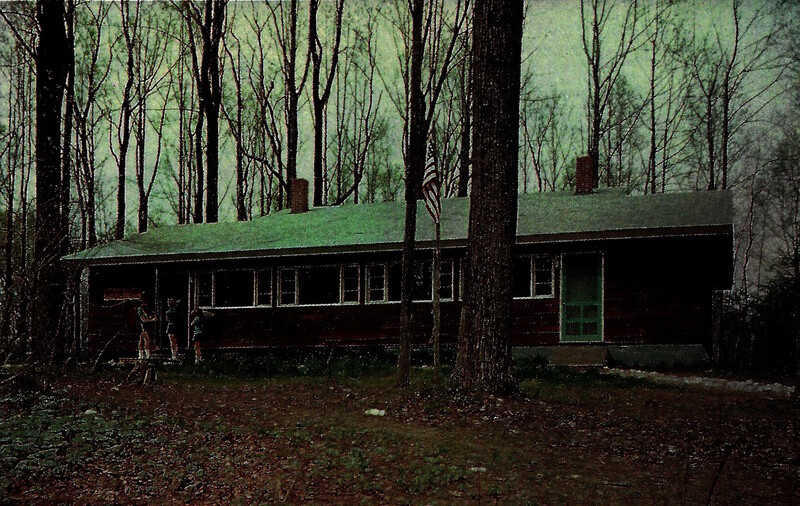 Weston Lodge at Rockwood National Center (demolished in early 1980s). They came up with a wonderful assortment of patches and stuffed animals (naturally), but also puppets, t-shirts, dolls, mugs, and jewelry. They included a plaque of appreciation presented to Nation’s Capital by Little Brownie Bakers, as well as an old Weston Bakery box and photo of Weston Lodge from Rockwood National Center. In the early 1950s, W. Garfield Weston gave $25,000 to kick-start a $200,000 expansion program for the national camp. Pewter-like incentives from 1999, 2000, and 2002 (eBay photo). Installing the exhibit down at council on a Saturday, the set up team met the council’s product sales manager, who gave them an insider view on the process. They discovered that Nation’s Capital did not offer the adorable puppy hat from 2006—but decided it was too cute to leave out. 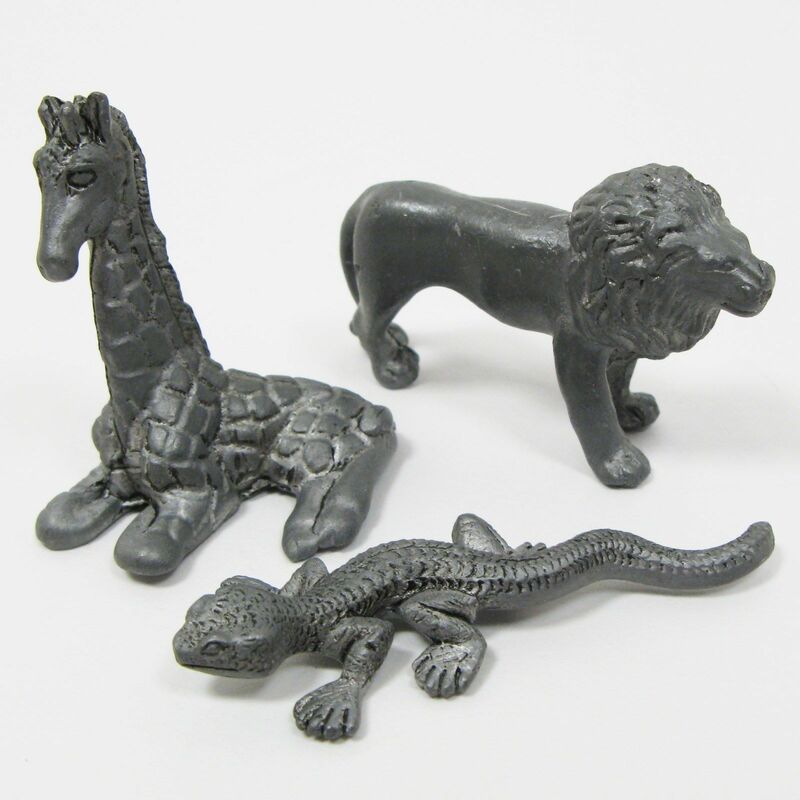 They also learned that the pewter animal prizes (and every girl in the troop seemed to still have at least one) were actually not real pewter. What’s more, when they were discontinued, the girls didn’t complain—but parents did! The display will remain in the lobby of the council main office at 4301 Connecticut Avenue NW through March.